‘I hope these disparate pieces add up to something’, writes Martin Amis with uncharacteristic diffidence in his introduction to this collection of occasional journalism ‘offered with all generic humility’. No time spent in Mr Amis’s company is ever wasted. He is a fine novelist who turns an elegant and often hilarious sentence. But even at the beginning of this volume, Amis seems to be hedging. ‘I should have worked harder,’ he jokes. ‘But it was quite hard work getting the stuff together (photocopying back numbers of journals can be a real struggle and that Xerox flap tangling you up and getting in the way).’ This comic disingenuousness is cute enough to forgive him almost anything, even misrepresentation. The Moronic Inferno, a terrific polemical title borrowed from Saul Bellow by way of Wyndham Lewis, promises social revelations, fierce debate, scandalous discoveries, a perilous descent into a barbarous society. But Amis turns out to be a day-tripper in an American theme park. Amis’s America is an amalgam of the top of the literary pops (Bellow, Capote, Updike, Roth, Didion, Burroughs) and yesterday’s headlines (von Bulow, Hefner, Reagan on the campaign trial, Jerry Falwell, the Atlanta killings). 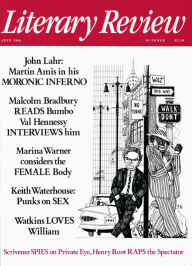 What emerges out of Amis’s suave Sunday supplement style is a genre of reportage best described by Jimmy Durante as ‘non-friction’.